A Body in Fukushima presents a series of color photographs by artist Eiko Otake and photographer William Johnston taken in Fukushima following the destructive explosion of the nuclear plant in 2014. Eiko and Johnston followed abandoned train tracks through desolate stations into eerily vacant towns and fields in Fukushima, Japan. Following the 2011 earthquake and tsunami, the explosions of the Daiichi nuclear plants made the area uninhabitable. 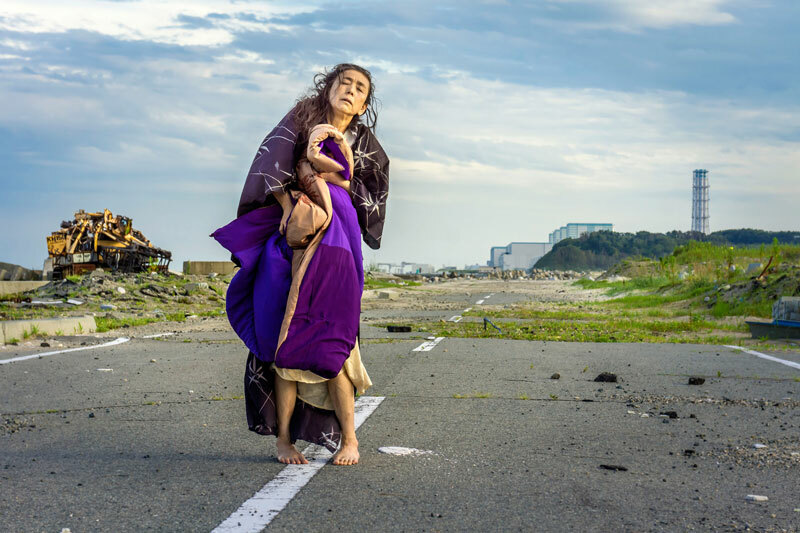 Through both vulnerable gestures and fierce dance, Eiko embodies grief, anger and remorse. Johnston’s crystalline images capture her movements within desolate Fukushima landscapes.